Love it! Your kids are so cute. See you soon. Your not working tomorrow right? Oh how FUNNY!!! 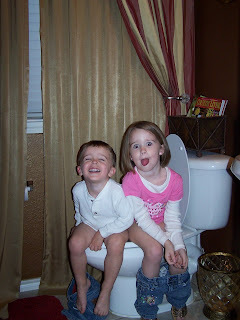 How is it possible for two children to go potty at the same time??? I wonder if my two would ever think to do that? Miss you, talk to you soon. Too much! They are so funny! That picture is one of the funniest...Jacob in the swimsuit is a close 2nd! hilarious! i just hope they wiped their own hiney and not eachothers!! This is David. I clicked on the link to your name but did not see your blog? Am I missing something? that is such a great picture. way better than me dancing on stage at FM 360. Brooke is well. Sorry I didn't get a chance to speak with you last night. I will see you on Thursday. Oh thank God other peoples kids potty at the same time! Mine are standing though so I can't take pictures! Hey Keri! You posted on my site, Kip does remember you! And we LOVE Nikki! VERY SMALL WORLD!